Bet You Can’t Leave Just One! Last week in this column I wrote about fidget spinners, one of the simplest forms of entertainment ever. This week’s suggestion for low-tech fun is a little more challenging. It’s the “Old-Fashion Peg Game,” found at every table at every Cracker Barrel in the USA. I’ll wager there aren’t many folks reading this newspaper who haven’t tried to solve the puzzle. 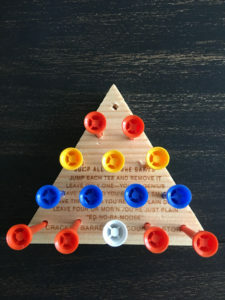 The game is played on a small, triangular wooden board. It contains 15 holes, 14 of which hold a plastic peg. The challenge is to jump the pegs until only one remains on the board. The rules are simple: Any peg may be used as a jumper as long as the peg jumped is adjacent to it and has an empty hole next to it. Every jumped peg must be removed. Any player who succeeds in leaving only one peg on the board is a genius, or so the instructions claim. In researching this topic, I learned that an intricate mathematical theory explains the puzzle. Fortunately, it’s not necessary to understand the theory to win the game. There are 6,816 solutions, but they’re all modifications of just two main solution patterns. As in chess strategy, it’s crucial to plan ahead carefully. You can mess up the game with just two bad moves. After that, the puzzle becomes impossible to solve. If you’ve tried the peg game, you know it’s not as easy as it looks. I’ve managed to get down to two pegs many times, but almost never down to just one. A couple of weeks ago, I accepted a lunch invitation from my friends Mary Alice and Brad. “Let’s go to Cracker Barrel,” they said. “We’ll teach you how to win the Peg Game every time.” How could I say no to such an offer? The waiter-in-training assigned to our table said he had no idea how to do it. “Puzzle solving isn’t required for employment,” he told us, “but I’d sure like to learn.” Unfortunately, he was too busy figuring out how to refill iced tea glasses and where the side items are listed on the menu to have time to sit down and take lessons. But I had time and I had a great teacher. Brad set the game in front of me and showed me which peg hole to leave empty at the start. In 13 moves, he coached me to immediate success. I practiced three times and was victorious three times. Easy peasy. After we finished our meal, I stopped in the gift shop and bought an Old Fashion Peg Game of my very own. I don’t play it every day, but when I do I always win. You can, too, and here’s how. Fork out $3.99 and buy the game. Read and follow the “Directions for being a Genius!” which are included. Or meet me for lunch at Cracker Barrel and I’ll share the secret.